The Incarnate Son of God for thirty years lives obedient to his parents in an ordinary, hidden life of prayer, family, and work, before beginning his public ministry. Mary and Joseph secretly ponder and guard the mystery of how God sanctifies our everyday lives and calls us to holiness in the ordinary. 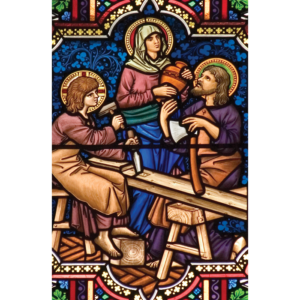 Peacefully visualize the Holy Family at Nazareth, working, praying, studying, eating, conversing, laughing. Imagine how, amidst the various events taking place throughout their years, the Holy Spouses always have Jesus at the center of their lives. Experience Jesus, Mary, and Joseph calling you to holiness in your ordinary, everyday life. Mary, full of grace, and Joseph, son of David; honor to you, Mother of God, and to you, guardian of the Redeemer. Eternal praise to the child with whom you formed a family, Jesus Obedient unto Death.